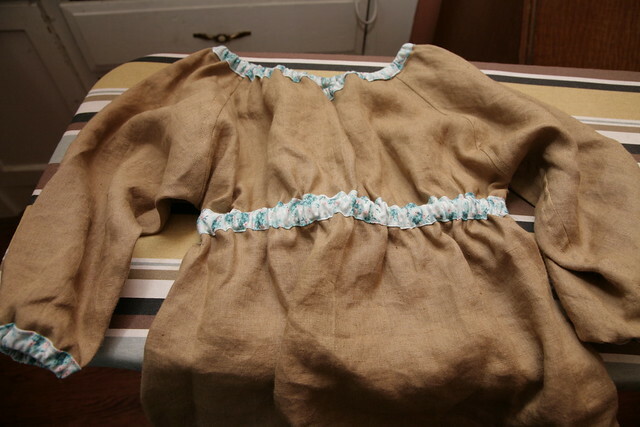 Inder Loves Folk Art: KCWC Day 7 - Prairie Blouse. I finished off KCWC with something completely different. This is the Prairie Blouse, from Anna Maria Horner's Seams To Me. It's a (very) late birthday present for a friend's daughter. She's a size 5/6, which is outside of the range of my Oliver + s patterns, so I decided to try something new. Because I didn't have the opportunity to fit this to its intended recipient, there was some guess-work involved, so I dearly hope that it fits! Or if it doesn't fit, I hope it's too large, rather than too small! But such is the nature of sewing presents for children you haven't seen in a few months. Fingers crossed. I am really happy with the fabric choices, though. 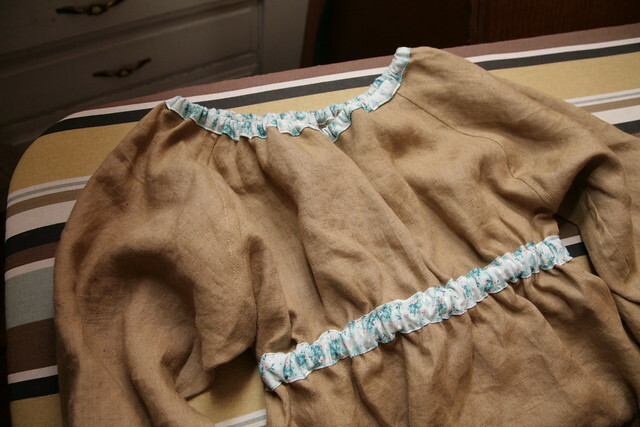 The tan linen is soft and drapes beautifully, and you may recognize the blue print from the last Ice Cream Dress I made. I almost went with a shabby-chic rose print that was a more traditional match against the tan fabric, but I'm glad I didn't: the blue and pink floral really pops, giving this super romantic top a little bit more modern pizzazz. I hope the recipient likes it! And so ends KCWC! I completed three garments this week, which isn't half-bad considering I had to work around a toddler and a day-job. And I only really started to burn out yesterday, on Day 7 of the challenge, and only after the third hour or so, which just goes to show - I really enjoy sewing! The best part of the challenge for me was seeing the amazing things that the other participants made this week, reading all about it, and discovering new blogs/bloggers. I also loved getting comments from some new readers, I hope you'll stick around! Seriously: the online sewing community is awesome. It reminds me of the sewing-camaraderie I used to feel when I worked in a fabric store, except it's even better. I'm looking forward to doing this again ... after I've had a chance to recover from this round, that is. So now I think I'll take a little time off of sewing and focus on playing with Joe for a few days. Whew. Absolutely gorgeous! Congratulations on sewing so many lovely pieces this week. That's totally lovely. I would completely wear that! Love the fabric choices. In fact when I got Seams To Me I was a bit bummed that this pattern was only in kid sizes. Great KCWC work! Love this! I did recognise the trim fabric! I had fun this week too!